The First ImageInLife Conference took place in Gif-sur-Yvette (France) from 22 – 31 January 2018. 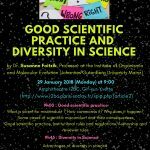 Training session on Ethics& Responsibilty in Science & Gender issues was given to ESRs (and to the large public) by Prof. Susanne Foitzik (University of Mainz) on 29th January 2018 (4 hours). 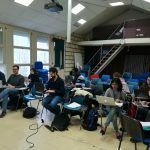 Many cases of scientific misconduct were discussed and the workshop ended by an interesting debate between students and experienced researchers. The workshop also included the introductions to ImageInLife animal models: rabbit model by V.Duranthon (INRA, France), zebra fish model by J.-P.Levraud (Institut Pasteur, France) and mouse model by P. Bousso (Institut Pasteur, France). 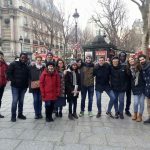 A teambuilding activity (game in Paris city center) was organised for all ESRs on 27th January 2018.